I know schools across the country operate differently but, around these here parts, Letters of Intent are kind of a big deal. It basically amounts to a Senior confirming their intent with a university or college to participate in their sports program and attend their school. Logan was accepted at the local university with both academic and athletic scholarships. He will be running on their Cross Country and Track Teams. Jason and I showed up to represent Logan, and two other parents were at the meeting to represent their Senior. 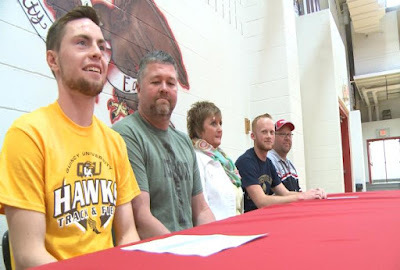 After signing his Letter of Intent, Logan and the other Senior were interviewed by two local TV stations and the town newspaper. The best part of Logan's night was when former teacher and coach, Mrs. Dyer, showed up unexpectedly. Although she no longer teaches or coaches Logan, she has been a huge support and mentor. She checks up on him to see how he's doing, has been to some of his high school track meets, and has nothing but good things to say about him. Logan busted out in tears when he saw her there. She's definitely had a huge impact on his life. Logan didn't cry because I was there. Whatevs! But he did give me a pretty amazing ribbon. I'm the World's Okay-ish Mom. I'm okay with that! This is so exciting!!!!! I love this. It's like the draft for teenagers. So cool. He didn't cry because he KNEW good ol Mom would be there supporting him. That's a GOOD thing that he wasn't surprised by your presence--means you are doing something right and working hard toward that Okay-ish Mom of the Year award. OMG, you must be SO proud! God bless Logan! And you! What joy you have from him!